Pattern Description: Bunches of flowers are circled with leaves on each panel; a large knob at the base has a floral decoration around it. 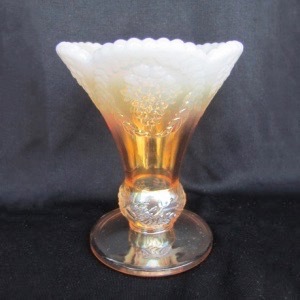 Not much is known about this 5 1/2″ tall peach opal footed vase, but the shape is very distinctive. It has a round base with a large decorated knob above the base, then a trumpet shape flared up to an edge that has 9 smooth balls on 5 scallops. A bunch of flowers (Wisteria?) are framed by a leafy circle.